At least a decade before the “Global 68,” students in Guatemala and elsewhere around the world were leading their own political struggles and connecting them with others. Students confront police in Guatemala City, 1962. via Barrancópolis. The story of 68 so often goes as follows: in response to emergent identity-based movements and colonial wars, a rising tide of political alienation among youth broke in mass protests in the summer of 1968. The perceived distance between the people and the key institutions of society, including the state, the school, the church, and the family, led some to “tune in, turn on, and drop out,” and others to turn up to protests. In this story, the summer of 68 was a breaking point, sparking a significant set of enduring cultural changes. Political culture, then, could be divided into pre- and post-68 eras. While this narrative obviously emphasizes the US and European urban centers (especially Paris, Prague, and campuses of US universities), somehow in the last half-century, it has become the global story of the period. There are more than a few features of this narrative that don’t stand up to the purported universality of “1968,” one of the twentieth century’s most resonant synecdoches. For one, it implies that protests were, at most, responses to discrete events. I will return to the limitations of this view below. Moreover, this narrative imputes a sort of pre-political subjectivity to students and youth before the flashpoint of conscientization in the summer of 68. Epitomizing this view, in 1969, Vice President Spiro Agnew famously complained, “the student now goes to college to proclaim, rather than to learn” (emphasis mine). But in so many other parts of the world, students (as such) had helped topple dictators, write constitutions, establish social security institutes, found racial justice organizations, and cultivate international anti-colonial solidarities for many decades. In their 60s, the historical memory of these struggles was more powerful than images of street protests in Paris, Prague, New York, and Berkeley. More recently, a number of historians of Latin America, Asia, and Africa responded to this Euro- and US-centrism by highlighting the protests launched in their regions, essentially arguing that there had been a 68 elsewhere, too. This scholarship has usefully reinvigorated social movement scholarship, yet this recent boom invariably re-imposes a limited periodization (dominated by the October 1968 Tlatelolco massacre) and new metropoles or centers (Mexico City obviously comes to mind). Still, this scholarship all-too-often portrays student protest as spontaneous, or isolated in a year, or even as a response to protests in the US and Europe. On the contrary, a wealth of newspapers, student-authored polemics, and ephemera demonstrate that students in Guatemala, El Salvador, Honduras, Costa Rica, and Nicaragua had long been at the forefront of anti-colonial protest movements. Organized student movements occurred in Central America early as the 1920s in the case of students’ participation in the Sandinistas’ struggle against the US Marine Corps and Honduran students’ rejection of US businesses in banana exportation. Subsequent student movements would build on these anti-colonial legacies. Across much of twentieth century emerged a loose consensus around faith in the principles of liberalism, especially belief in equal liberty, the constitutional republic, political rights, and the responsibility of university students to lead the nation. Within this loose consensus, Marxist-Leninists, anticommunists, Keynesians, pan-Mayanists, and others could find a shared political rhetoric with which to support diverse ideologies. Students’ complicated negotiations over identity and ideology can teach us more about the construction of social class and the university than a romantic story of student activism. Put plainly, at least a decade before the “Global 68,” students around the world were interested in both the political struggles they shared and those that were particular to certain places. The mid- and late-1950s brought a surge of transnational exchange for students in the Americas. Students at Guatemala’s only public university, the Universidad de San Carlos (USAC), called San Carlistas, epitomized this circulation. San Carlistas attended the first Congress of Latin American Students (OCLAE), which was held in Montevideo, Uruguay in 1955. Two years later in La Plata, Argentina, the group reconvened to discuss a range of topics. They examined administrative and educational problems confronting the university (autonomy, participation in university government, free education, teachers, university extension programs, and literacy); political problems confronted by students (dictatorships, Latin American unity, imperialism, and worker-student solidarity); and finally, the “international student situation” (analysis and recommendations). The March 3, 1957 edition of the university’s newspaper, Boletín Universitario, detailed the congress for a readership that seemed eager to learn more about the experiences of their peers around the world. In December 1956, one USAC student joined a delegation of student leaders from the US, Gold Coast, South Africa, and Italy on tour of Indonesia, Pakistan, India, Burma, and Vietnam. San Carlistas were regular attendees at International Union of Students (IUS) and International Student Conference (ISC) congresses. All of this travel enabled, if not a worldwide movement of students, then at least a shared understanding of anti-colonial struggle in the midst of the global Cold War. In Les Damnés de la Terre, Frantz Fanon ironically observed, “The leadership and students of the underdeveloped countries are a gold mine for the airlines.” Those that couldn’t travel could read about their classmates’ experiences in USAC student newspapers or the trilingual magazine of the ISC, The Student, which circulated at least occasionally in Guatemala. A handful of years later, 1968 came to Guatemala six years early. For six weeks, university and secondary school students battled the military and police, bringing much of the nation to a standstill. 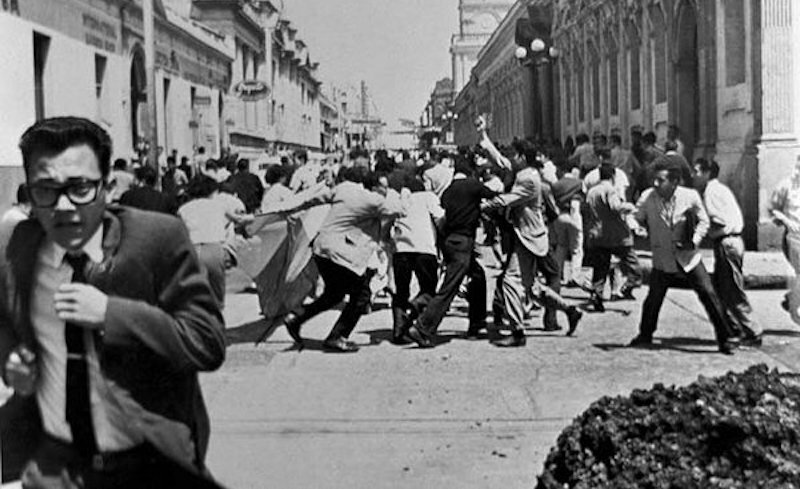 In February 1962, president Miguel Ydígoras Fuentes declared a state of siege in anticipation of widespread protest of fraudulent midterm elections. A few weeks later, a group of USAC demanded, among other things, the annulment of the election results and an end to the state of siege. Ydígoras was in Nicaragua at the time, visiting with Anastasio and Luis Somoza Debayle, which didn’t help his case. On March 1, law students dressed in mourning suits held a funeral for freedom and democracy, unfurling black banners and placing a funeral wreath at the congressional chambers with a note expressing their sorrow for the disappearance of an independent legislative power and the end of the rule of law. The group also sent telegrams calling attention to the electoral fraud to student unions at other Latin American universities and to an international summit of Latin American leaders in Chile. It was a propitious moment for oppositional politics with the recent success of the Cuban Revolution at the Bay of Pigs and the public appearance of the Guatemalan guerrilla group, MR-13. Three days later, a bomb exploded at the student union offices. Paid political advertisements that threatened the group and alleged that its student leaders had communist ties appeared in national newspapers. University students, and soon secondary school students (whose ranks counted youths as young as fourteen), responded with strikes and demonstrations at governmental offices, university buildings, and three secondary schools, Rafael Aqueche Institute, INCA, and National Central Institute for Boys (INCV). Thumbtacks, rocks, sticks, and burning trash blocked streets and sidewalks. The demonstrations continued for weeks, paralyzing Guatemala City and Quetzaltenango, Guatemala’s second-largest city. Skirmishes spread throughout the capital as residents erected barricades to block police access to their neighborhoods. As the violence escalated, protestors seemed emboldened rather than cowed. The government retaliated by closing all of the capital city’s secondary schools. In mid-March, student protestors were joined by railroad workers, the University High Council, the national teacher’s union (FUMN), and the Autonomous Federation of Guatemalan Unions (FASGUA). Even business groups upset with the regime’s corruption and the effect of political instability on foreign investments expressed their opposition to Ydígoras. Around this time, some young Army officers reached out to student leaders in anticipation of Ydígoras’s overthrow, actions reminiscent of the 1944 revolution. Only the Chamber of Commerce, part of the powerful Coordinating Committee of Agricultural, Commercial, Industrial, and Financial Associations (CACIF) continued to support Ydígoras and denounced the strike. At this point, the strikers’ demands had expanded to include rewriting the 1956 Constitution, indicting government officials in a court of law, and building an entirely new government. The police responded by laying siege to campus buildings nationwide. By the end of March, the cycle of protest and reprisal slowed. While in many respects, the March protests had enabled the Army and the National Police to extend their use of force against dissenters, they had also fueled opposition among younger students and inspired ever-broader alliances. Then, in early April, protests began anew. The historic annual student carnival, La Huelga de Dolores, approached, promising pranks and drunken revelry. Student organizers built barricades and limited alcohol sales in an effort to maintain peace, but at some point during the march, a military patrol car sped through the barricades and killed one student. The vehicle sped away toward the Law school where, moments later, shots were fired into a crowd assembled at the entrance. Two more students were killed and another was gravely injured. Rumors spread that the attacks were planned. Ydígoras called a press conference and refuted the rumor. Some began to refer to the deaths as a “massacre” and recalled earlier moments when the military and police had killed students. Nearly 10,000 mourners attended the funerals of students who had died in early April. More labor unions, women’s organizations, the Association of Guatemalan Journalists (APG), and even business groups published anti-Ydígoras paid political advertisements. April ended with another state of siege and another wave of arrests. Defense Minister Colonel Enrique Peralta Azurdia received an executive order that gave him carte blanche to suppress unrest. By May, students had returned to their classes and the government had imprisoned around 2,000 people and killed four USAC students and eleven high school students. These six weeks of protests through March and April became known as the Jornadas. They marked a turning point in the government’s relationship to protest. Many San Carlistas who became active in the opposition in the late 1970s (including Manuel Andrade Roca and Ricardo Martínez Solórzano) remembered the Jornadas as their radicalizing experience. Both men would be assassinated in early 1979. Writing more than a decade later, the guerrilla Fuerzas Armadas Rebeldes (FAR) pointed to these protests as the moment that made clear the need to take the armed path of revolution. News of the Jornadas reached student audiences worldwide when a story was published in the ISC’s The Student. At the end of two months of combat, tens of thousands of people had been mobilized in demonstrations, two guerrilla groups had launched rebellions, and around fifty civilians had died. Central Park, the Trébol, city buses, popular radio stations, and certain downtown street corners had become spaces of protest, martyrdom, and popular victory. Many factors, including the visibility of the protests, their risk, and the growing multiclass coalition, bolstered the opposition. The historical memory of earlier struggles in 1956 and 1944 also provided powerful fuel. Ydígoras’ reputation suffered irreparably. His regime spent the remainder of 1962 consolidating its control over the capital city and portraying students in the press as psychotic treasonous bomb-throwers. For their part, in August 1962, a group of students denounced foreign experts and curriculum, which sought to “domesticate the consciousness of our intellectuals and youth” in nothing less than an intellectual invasion. They called for the nation’s community of scholars to join together and develop nationalist forms of knowledge that respected the needs, interests, and resources of the people. They reached deep into the university’s legacy: anti-colonialism connected the próceres who fought Spanish colonial power to the student combatants against the dictatorships of Manuel Estrada Cabrera and Jorge Ubico to the protestors of the Jornadas. If the preoccupations of 68 in the US and Europe were war, racism, authoritarian states, alienation from church and family, and economic malaise, in Guatemala, but also Nicaragua, El Salvador, and Honduras, student protestors faced other issues. They ceaselessly reflected on the relationship between the university and the community; debated the role of the organic intellectual and the timing of armed rebellion; and interrogated the region’s economic dependency (dependencia) and under-development (subdesarrollo). At the Conference of Latin American Bishops (CELAM) in Medellín, Catholic priest Gustavo Gutiérrez coined the term “liberation theology” and CELAM issued a long apologia for an active role for the church in fighting injustice and promoting political, existential, and spiritual freedom. In sum, Central American revolutionary nationalisms were informed by historical memory of earlier struggles, international anti-colonial solidarities, Marxist-infused critiques of economic colonialism and dependence, and religious faith. Unlike most of their peers, they developed ideas that would fuel decades of civil war. Long before the 1960s, the social category “el estudiante” (the student) came to denote not only age or institutional affiliation, but also a political identity, deployed as adjective and noun in daily newspapers and university publications. It had come to signify any oppositional group of young people across much of Latin America and the Caribbean. In other words, while the protests in the summer of 1968 may have taught the US and Europe about this sector’s political power, in Central America, as in Peru, Argentina, Chile (where student movements in the 1910s and 20s had effectively reorganized the entire higher education system), and other parts of Latin America, this was already well-known. In Central America, student power endures. Recent weeks in Nicaragua have seen young people and others rallying under the category of “el estudiante” to reject President Daniel Ortega’s social security reform and — increasingly — to demand his resignation. These masses, who are more than young people enrolled in one of the nation’s many public and private universities, are competently and convincingly deploying the slogans and roles of their predecessors. In May 1968, Ortega and fellow Sandinista combatants signed their communiques “Free Fatherland or Death”; in May 2018, Ortega’s fatherland is haunted by the ghosts of revolutionary martyrs and disappointments while the students call free market globalization. I would like to thank the workers of the Centro de Investigaciones Regionales de Mesoamérica (CIRMA) in Antigua, Guatemala, and the Archivo General de la Universidad de San Carlos (AGUSAC) in Guatemala City, where much of the research that informed this blog post and my monograph was completed. Heather Vrana is Assistant Professor of History at the University of Florida and author of This City Belongs to You: A History of Student Activism in Guatemala, 1944-1996 and Anti-Colonial Texts from Central American Student Movements.